How do you know the last time you volunteered really made an impact, or that the dollars you donated really created change? These are common questions for people who are seeking to make a meaningful and sustainable impact both at work and in their free time. 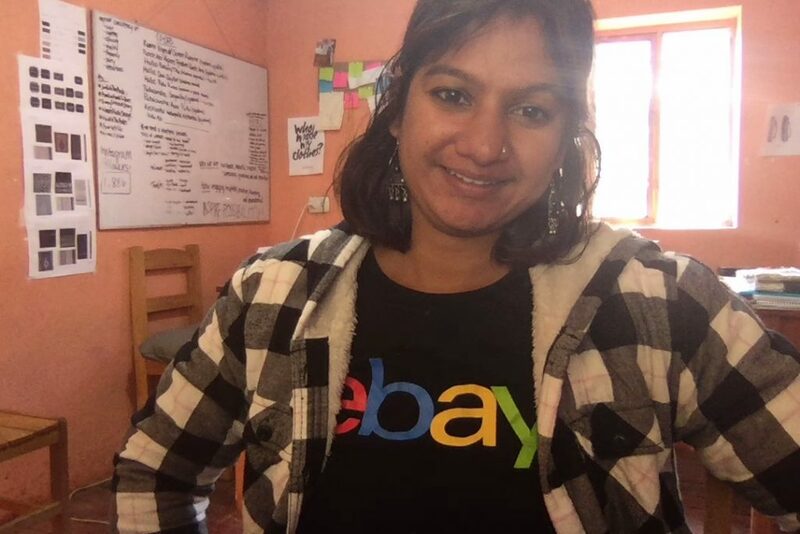 Ruchi, an experienced Product Manager at eBay, was trying to answer this very question by learning more about how to ensure that her work generated maximum positive impact. 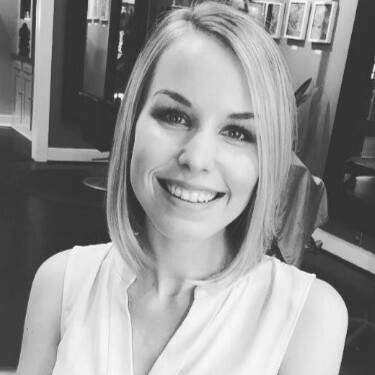 Volunteering has always been an important part of her life, and something she has pursued alongside her career. Her friends jokingly call her the “Queen of Volunteering”. Over time, Ruchi started wondering about opportunities to take what she was learning in one part of life and apply it to the other, and with each new project, asking herself: What could I do to make a more sustainable change both in my career and in my service work? Read on to hear about Ruchi’s journey in exploring how to be a more impactful giver, and a more socially engaged employee. What inspired you to “take the leap” and apply to Impact Teams? Volunteer work has always been an important part of my life. Before joining MovingWorlds, I had lots of smaller-scale volunteer experience, including as a volunteer teaching kids in slum areas, collecting donations and serving food in San Francisco through eBay’s partnership with Glide, working with local NGOs, and painting a government school in India. I decided to take on the challenge of experteering as part of an Impact Team to build on my past volunteer experience by using my professional expertise to solve real global challenges on a bigger scale. My upbringing, professional career, and opportunities I have been afforded as a result of my background are all things I’m grateful and am privileged to have. I am passionate about using my position in life to empower and support those who don’t have the same access to basic necessities that many of us take for granted. Experteering was an opportunity for me to help those who wanted to help themselves but didn’t have the knowledge and/or means to get to the next level. MovingWorlds has provided a medium through which people like me can make an impact in the lives of others with only a small investment of our time. I think being part of MovingWorlds set me up for success thanks to the comprehensive trainings and resources which gave me the boost I needed to make a difference on a larger scale. What was your Experteering project? 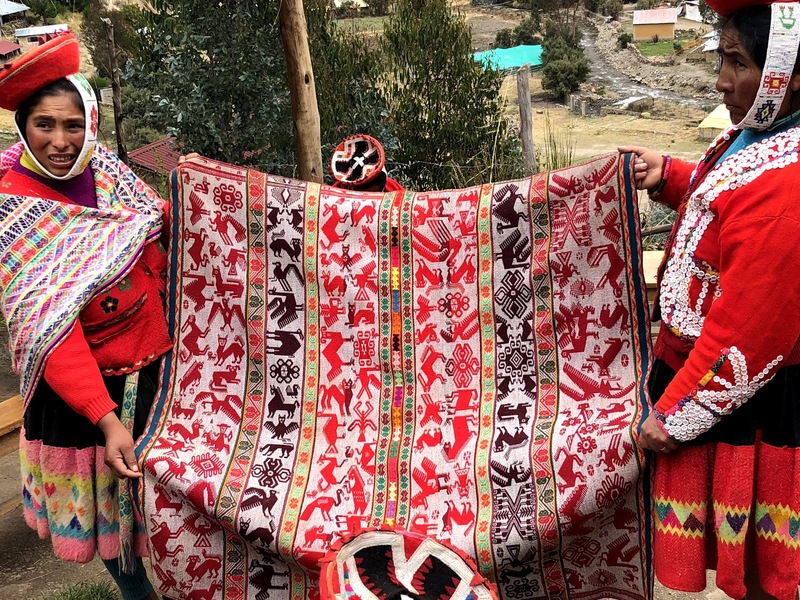 Through the MovingWorlds guided matching process, I partnered with Awamaki, a community development nonprofit in Peru on a mission to lift communities out of poverty by investing in women. To accomplish this, Awamaki works with rural and indigenous women and families to start their own small businesses by investing in their skills and leadership and connecting them to global markets, creating opportunities for a reliable source of income. 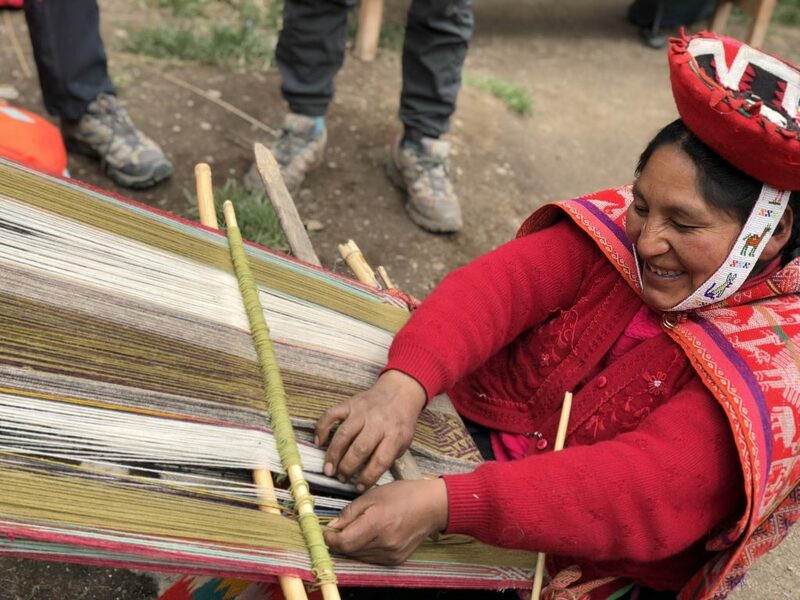 The team operates both a women’s artisan cooperative program and a sustainable tourism program, providing skills-building workshops and facilitating connections to broader market opportunities, ultimately impacting qthe uality of life in these communities for generations to come. What were you doing before you went experteering? I work as a Product Manager in the Shipping Services at eBay, where I also worked as a Software Engineer for about 3 years prior to that. I have over 10+ years of experience in Operations and Delivery management and Software Quality Testing, and I love to code for leisure. I am a Six Sigma Black belt and am constantly looking for opportunities to improve the business processes by making them simpler and leaner. I have also worked as a Computer Instructor for MS Office and Computer Networks, and enjoy sharing my expertise to empower others. I love when the work is challenging and gives me an opportunity to stretch beyond my comfort level. Outside of my job, I also volunteer in my local community and public library when time permits. We added tags and categories to increase the site traffic through SEO redefinition. We brainstormed on how to improve the user experience through better layout and a more intuitive user interface. In addition, we started to connect with the Unicef global market to onboard Awamaki’s products for increased market access, sales, and conversions. We also had conversations around how to increase the amount of donations that we get from various international sources to help sustain Awamaki’s impactful operations. What we started together while Experteering was only the beginning of a great project. I wish I had more time to bring about these changes myself, but appreciated that MovingWorlds emphasizes sustainability in scoping projects, and I made sure to leave the local team with blueprints and training for how to continue the project after I returned to the States. I learned some Spanish, and although I’m still a beginner, I’m determined to be fluent by the time I visit the Awamaki team next time! I learned the WordPress platform, which is something I never would have learned had it not been for Awamaki. I hope to create my own website in future when I get more free time. 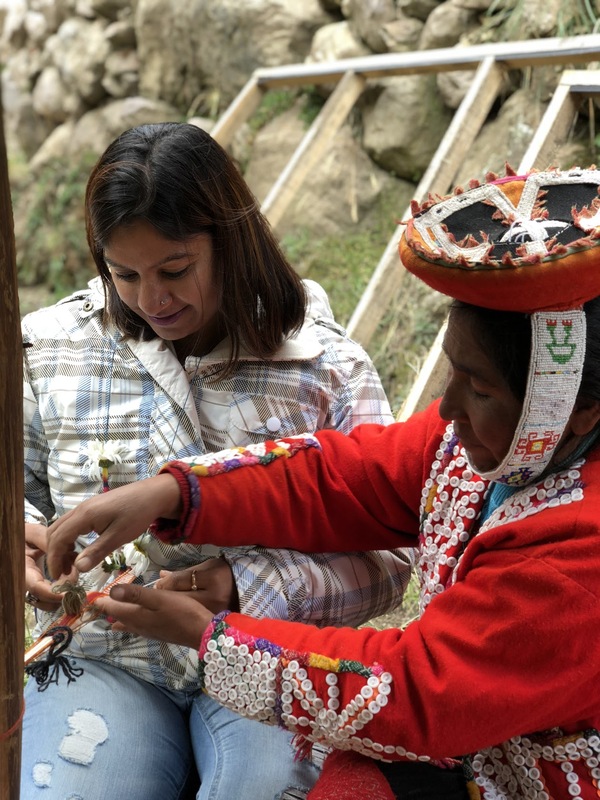 I experienced the Quechua culture, spent some time weaving a bracelet with the talented artisans in the Awamaki network. Anyay (thank you) Melissa for the best Saturday ever. I climbed Machu Pichu, and nothing can beat that treacherous hike and breathtaking views. I made some new friends and acquired memories that I’ll cherish for lifetime. I learned about international volunteering, thanks to MovingWorlds. I would like to connect again and even go on a second experteering trip after having such a great experience this time! For me, one of the most memorable days of the trip was the day we toured one of the cooperatives (i.e artisan groups) called “Patacancha”. 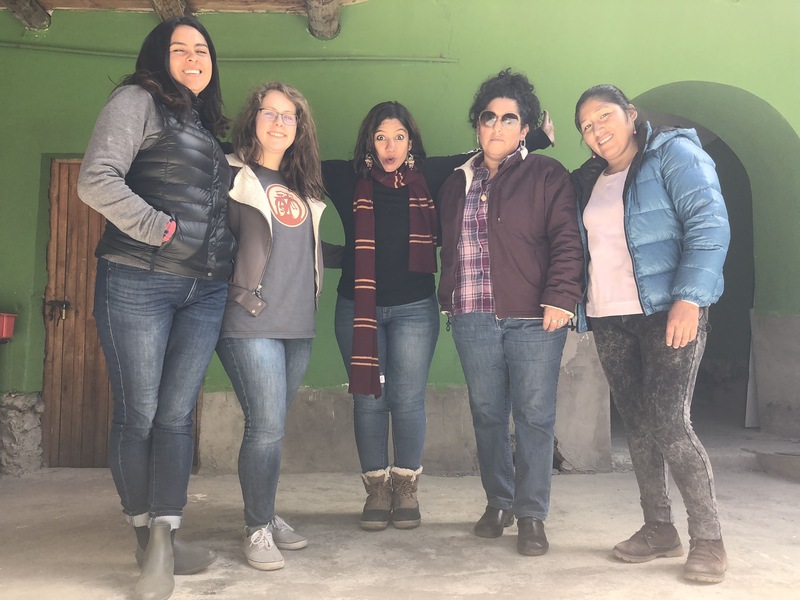 It was my first Saturday in the city, and the team included me in a visit to the mountain town where the indigenous women artisans live with their families. They showed us the process of spinning and dyeing wool with components obtained from nature (plants and insects) and then also conducted a small weaving session, where I weaved a bracelet for myself :) That’s a keepsake that I’ll treasure as a reminder of this great trip. Seeing the entire process from obtaining the wool from the llamas to turning it into a hat was quite intriguing and interesting. I also had the opportunity to take a cooking class with one of our wonderful tour guides, Melissa, where I learned some local Peruvian recipes. Seeing our volunteer guide speaking with the local women in the Quechua language filled me with great inspiration and also strengthened my belief and trust in the organization. I was motivated to start learning Spanish from that day forward, and I am continuing my learning streak even now that I’m back home! 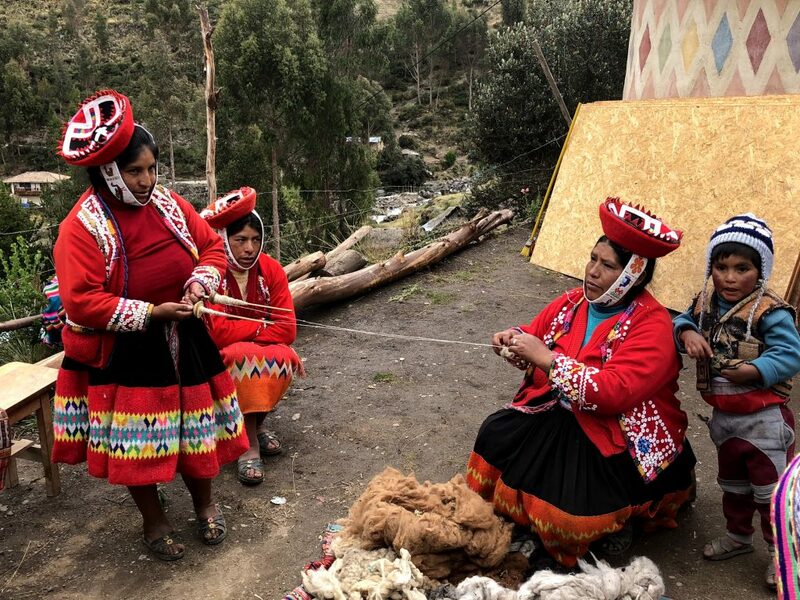 Having this opportunity to spend time with the Quechua women in their communities was inspiring and really connected me further to Awamaki’s mission. I learned a lot of new things, and also realized that life could be really happy even without a ton of material possessions and with no internet. What was one thing you wish you knew before volunteering overseas? Looking back, I think the biggest thing I’d do differently is to put even more into the planning and scoping process. Although I was able to communicate with my supervisor on the team in English, I also wish I had learned a bit more Spanish so that I could have connected more deeply with the locals. Particularly for a shorter trip, I realized how important it is to prepare as much as possible ahead of time so that when you arrive on-site you can hit the ground running. Next time, I plan to spend more time researching the company, diving deeper into its website, and confirming all of the logistical details with the staff to avoid miscommunications. I also waited until I arrived to start planning nearby visits to tourist destinations in my free time, and next time I think it would be a good idea to book these things in advance to ensure there was still time/space for me to participate in everything I wanted to do. What advice do you have for people thinking about Experteering? Spend the time to thoroughly research the organization, what they do, how they operate, their business model. The more information you have going in, the more quickly you’ll be able to jump into the flow of things when you arrive on-site. Be sure to take advantage of scoping calls with the organization representative to align on all details ahead of time, and to ensure that the person who you are supposed to work closely with is there all or most of the time you’ll be on-site. Most of all, don’t let fear delay your decision to jump in and experteer. Take the plunge, you won’t regret it! How did Experteering inspire you to continue making an impact back at home? The biggest change I’ve noticed so far has been in myself: this experience has changed my perspective on many things and will continue to influence a lot of my major life decisions going forward. For example, recently, I have noticed that my behavior towards giving/service has changed in that I am now looking for ways to be an active volunteer supporting ongoing, skills-based needs in society instead of engaging in disjointed acts here and there. I’m hoping that I can bring this spirit of service back to my role at eBay as well, and become more involved in our CSR initiatives. As counterintuitive as it sounds, I found that the more you give, the more you’ll gain in return. My faith in this concept has been strengthened multifold by this experience, and I am inspired and ready to give more. One simple act of skills-based volunteering can impact generations to come. Think about it. Those women are sending their kids to school because they have a steady source of income thanks to the work of this organization, and I’m honored to be a part of that. As far as translating these takeaways into my future plans, I plan to include my family in the experteering movement. My son, who will be in high school in a couple of years, will be ready to start volunteering soon and it’s something I plan to encourage. I also would like to continue to support Awamaki on a remote basis whenever possible, and if circumstances are still conducive to it when I retire, I’d love to jump right into working with the Awamaki team. This trip really got me motivated to continue down this path, both in my current role and alongside it. How has/will the experience impact the way you work at eBay now that you’re back home? Thanks to this experience, I returned to eBay with a fresh perspective and the confidence to lead positive internal change. I’m proud of eBay’s CSR program, and am excited to apply what I’ve learned to make it even better. In fact, I’m currently working on a proposal for building out such products for non-profit organizations like Awamaki to be able to easily set up shop in the eBay platform. I see a real opportunity for us to leverage eBay’s global market infrastructure to support likewise organizations by connecting them to the global market, creating greater impact for all parties. What was the most rewarding part of your trip? 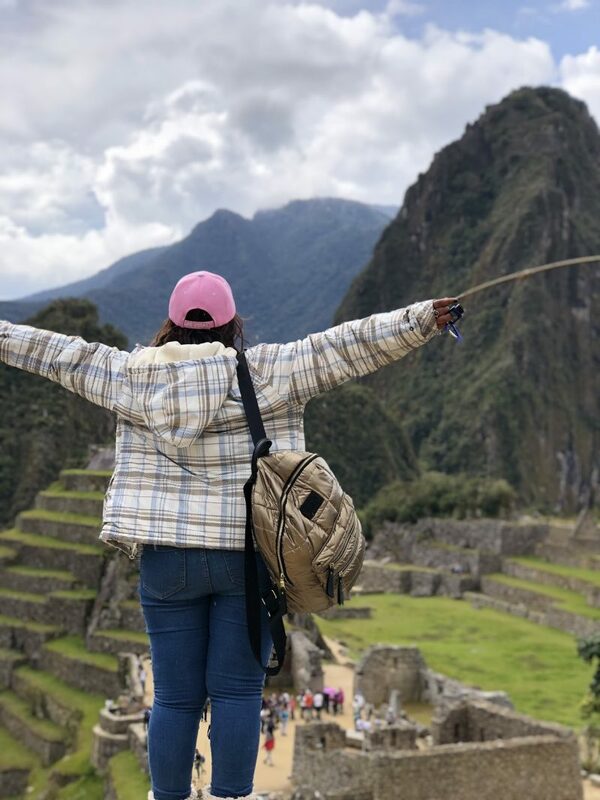 It’s hard to choose just one thing – the entire trip was such a rewarding experience and an unparalleled learning opportunity. One particular memory that really captures the overall impact this trip had on me personally was eating the yummy potato soup from the ‘Thank you’ lunch that the team had for me at the end of my time on-site, enjoying each other’s company, and realizing that in reality money does not equate to happiness. That was my best reward. The only question I have left is: When can I go again?! This was such a great experience and I’d repeat it in a heartbeat. For anyone else considering doing the same, I would advise everyone to plan your time wisely especially if it is a short visit so that you can make the most of it. It will be truly transformative. We’d like to thank Ruchi for sharing her story, and eBay for their generous sponsorship that made this all possible. If you’re ready to take your volunteering to the next level and be transformed in the process, you can apply to be part of our next Impact Team here. If you’re a CSR leader interested in sponsoring an Impact Team for your company’s employees, we invite you to download our free Connect the Dots e-book and join our #BeyondBuzzwords webinar series for a practical guide to implementing your social impact program as part of your leadership development strategy We’re looking forward to working with you!